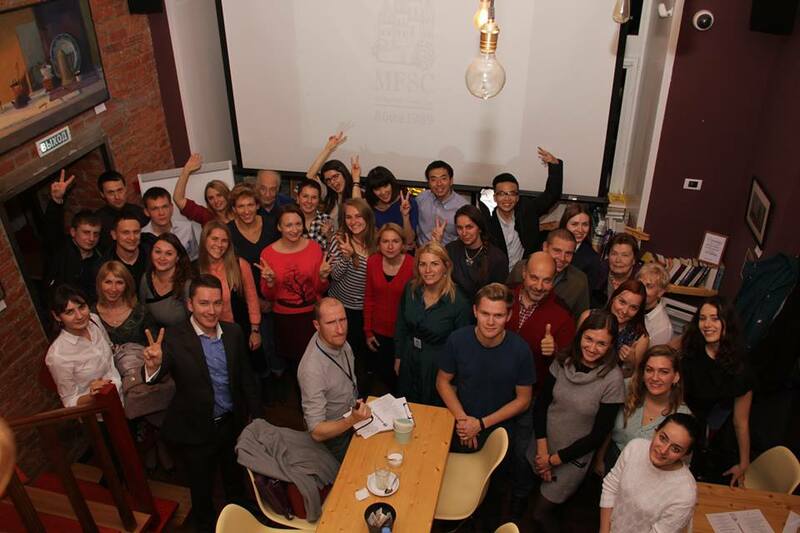 On 11 October our meeting very special event took place! We held our meeting in unusual place, at Native Speakers Cafe! Our speakers got new and challenging experience of speaking with microphone in the environment to which they were not used to! And they were very successful in it! Atmosphere in the cafe was very special and cosy, so the meeting was followed by unformal chatting at afterparty. [Dilara]: Hello Dharmajan! 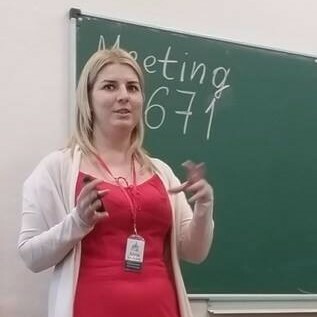 First of all – we are very happy you’re here, how did you like the meeting? [Dharmajan]: I saw a lot of creativity. For example, a small piece of paper from a cartoon on every desk to show the importance of the Word of The Day – it will remain in my mind for a long period of time! Even the Timer has presented her report very well with a graph! So there is a lot of creativity in the club, and I’m seeing those kind of things for the first time in the last 9 years. I’m very impressed and happy to learn this. 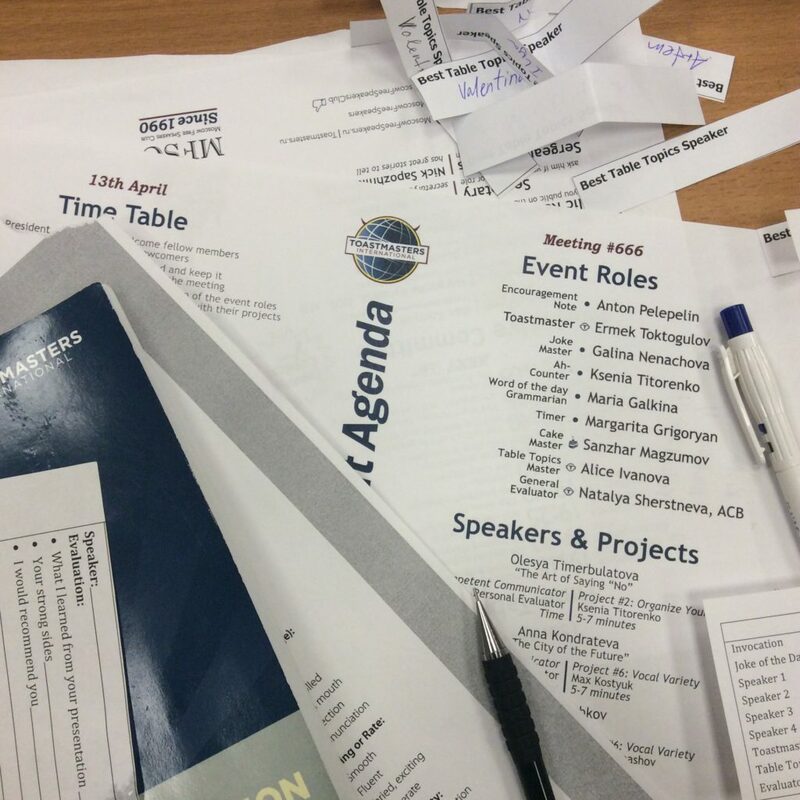 [Dilara]: Please tell us about your experience in Toastmasters: what roles have you taken, and what are your responsibilities in Toastmasters now? [Dharmajan]: I joined Toastmasters in 2009, and since then I have taken all roles in the club Executive Committee in multiple clubs. I was an Area Governor in District 20, which was the largest district in the world with 75 areas across 7 countries. During the year of 2014-2015, I was awarded the best Area Governor of the district. [Dilara]: What was your motivation to join the club, and how did you hear about it? [Dharmajan]: A college friend told me about it. After 2 years I’ve visited the club and found it very interesting. I saw the improved speaking skills of my friend, and I joined the club at the same meeting and since then I’ve never looked back. 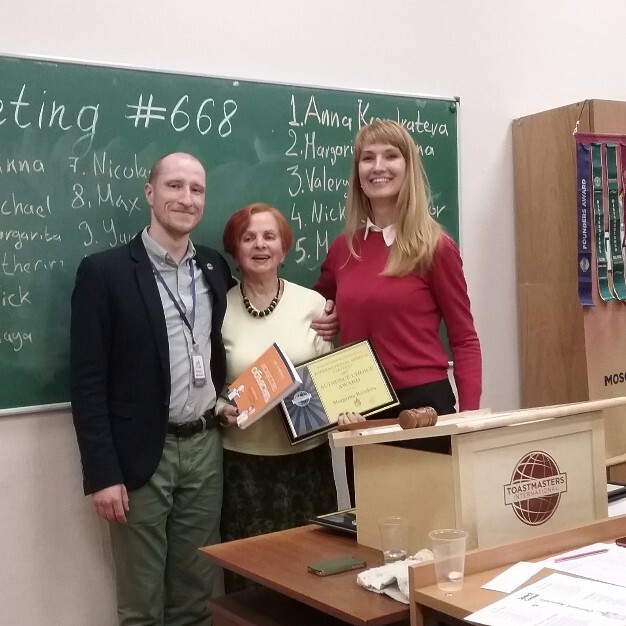 [Dilara]: What are the brightest moments of your long journey with Toastmasters? [Dharmajan]: For me there are many such moments. Even when your mentee comes and says “thank you”, you feel you can make a difference in someone’s life! Last year, at the 2016 International Convention held in Washington DC, I was holding the UAE flag, standing among the toastmasters who were representing 100 plus countries! So it gave me a platform to be united with the world. 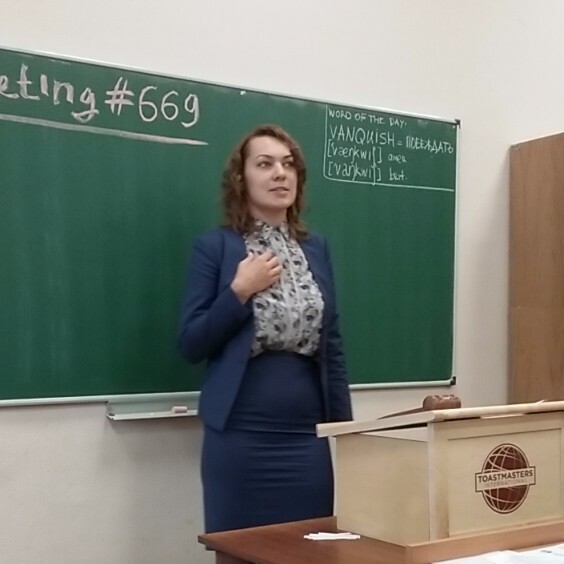 [Dilara]: What wouldn’t have happened in your life if you haven’t joined Toastmasters? 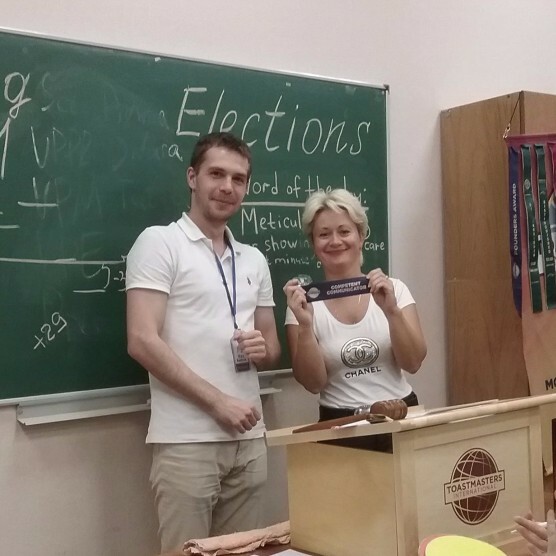 Toastmasters has helped me to travel the world. I’ve attended the 3 last international conventions, in Kuala Lumpur, Las Vegas, and in Washington DC. It also has helped me to see the world in a bigger and a better picture. Today I speak in front of 1000+ audience without hesitation and have got friends around the globe which wouldn’t have happened if not for Toastmasters. [Dilara]: What differences and similarities have you noticed among the people learning public speaking in different countries? 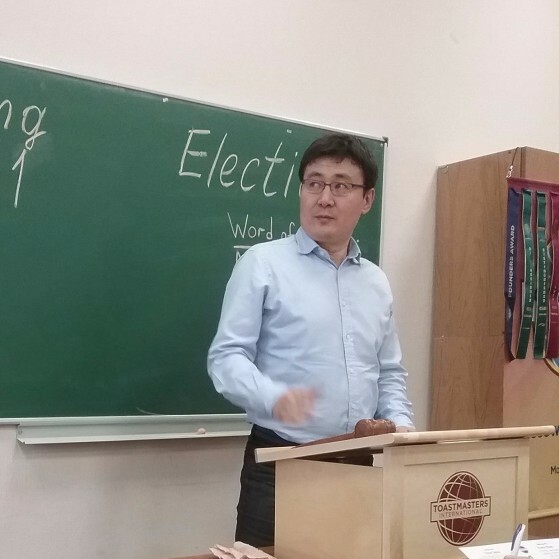 [Dharmajan]: Toastmasters clubs have the same learning program everywhere, however each club, even in the same country, has a different dynamics. The last meeting I’ve attended outside Dubai, was in my home town in India where a few of my college alumnus had started a new club. 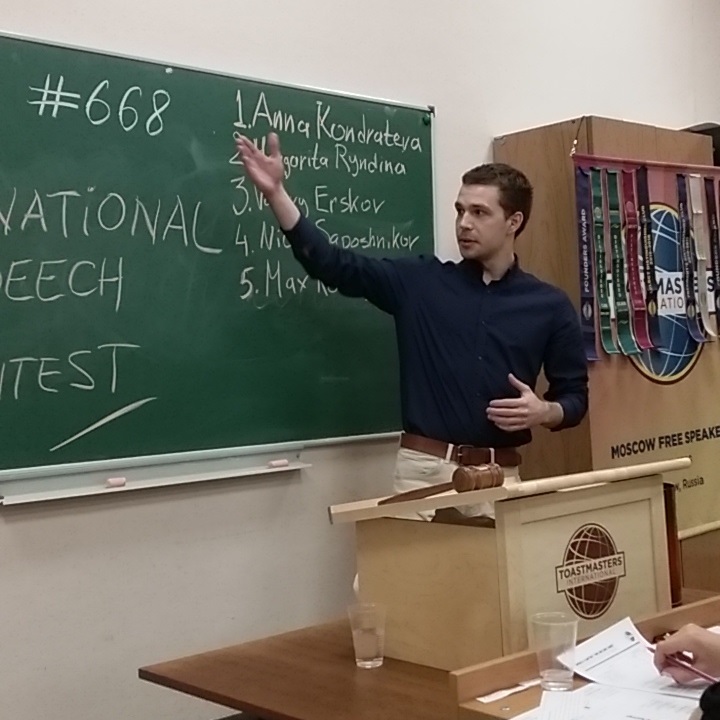 And I am also a member of an online Toastmasters Club, Firebirds Collective, which has more than 15 nationalities. So everyone comes up with different stories and different way of doing the things, and gives different learning experience. [Dilara]: What are your other hobbies? Are they in any way similar or connected to Toastmasters? [Dharmajan]: I’m an adventure sport enthusiast! That means doing something extra beyond normal. For example, scuba diving, or running a marathon, or skydiving – I need to go beyond my limits! Basically one of the biggest fears people have is going to the stage and speaking. Unless you attempt to do it, it remains a fear. Toastmasters gives a platform to stretch your capabilities – going beyond the boundaries. [Dilara]: Is it your first time in Russia/Moscow? What is your impression? [Dharmajan]: Today is my first day in Russia, I’ve just landed at 1 o’clock in the afternoon, and I still have to see a lot. But even before landing, your passionate club-members – the Secretary and the VP PR have made good impression about it. 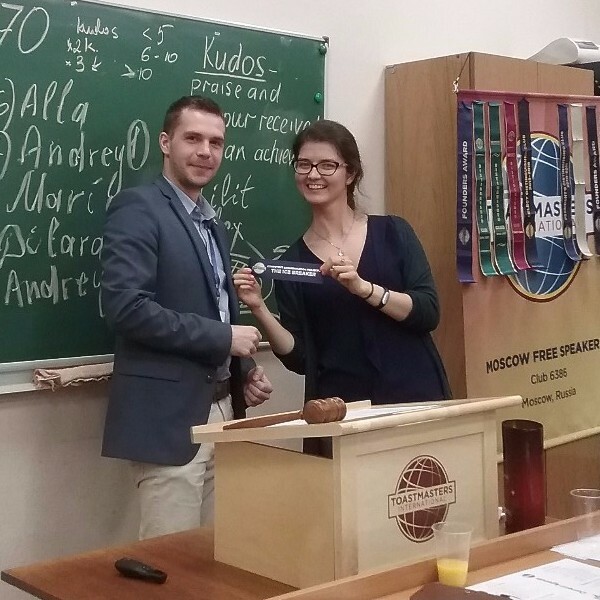 You are the ambassadors of your club and your country, and at Toastmasters here I feel like home. During my school days I used to read, “Misha” – a Russian publication for kids. I have a lot to see in this country, and I’m thoroughly impressed with lush green this country has, even in the city! 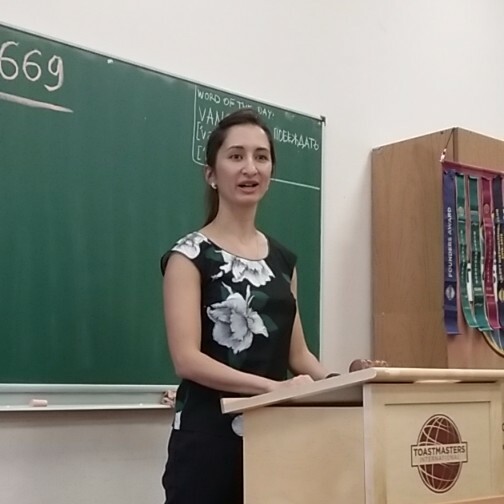 [Dilara]: What advice could you give to the fellow toastmasters? 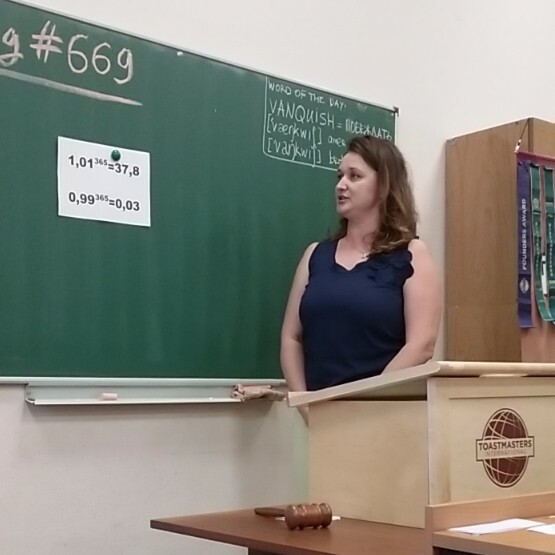 [Dharmajan]: Toastmasters always gives an opportunity to RISE, rise to your core values. 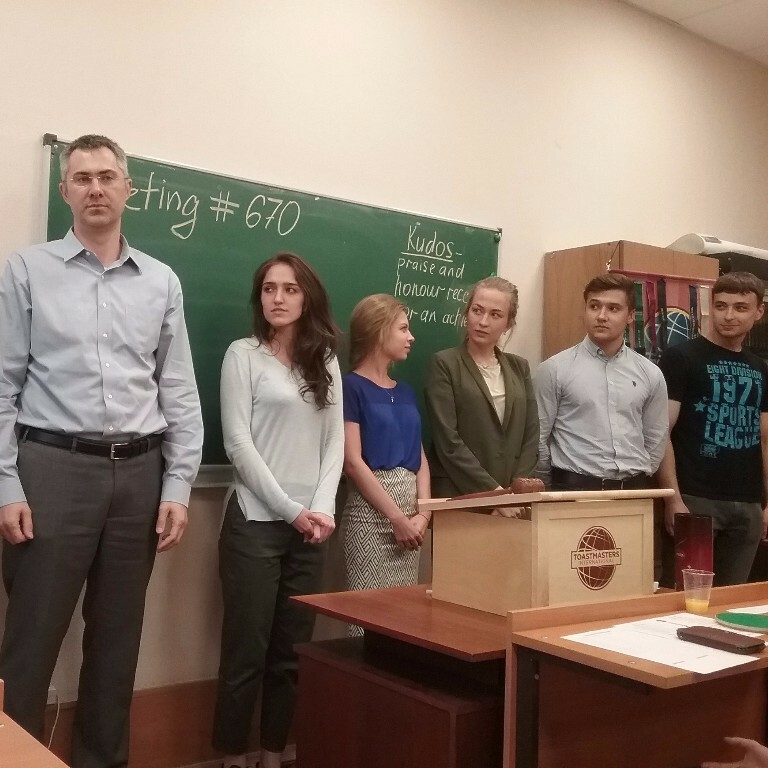 Toastmasters international’s core values are Respect, Integrity, Service and Excellence. 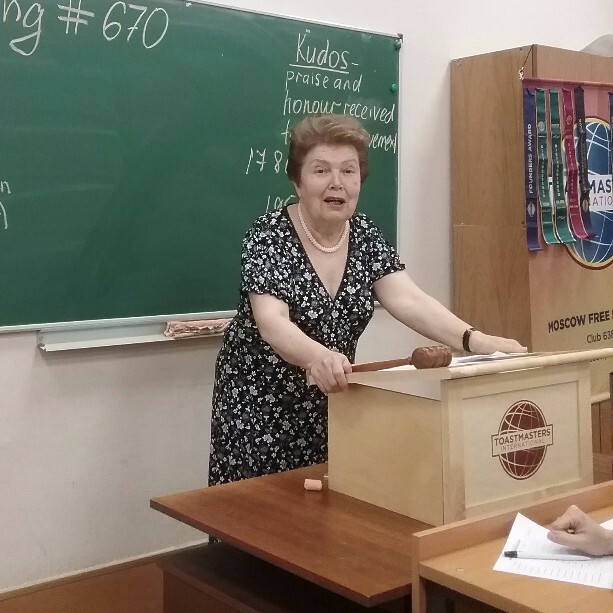 For a new Toastmaster – how much effort you put will decide how much you can get from this organization! Since it’s a self-paced learning experience, I will advise you to do your projects as quick as possible. In 2012 my mentor told me: “This way you are not going to get anywhere!”. Then I have finished the next 7 projects within 12 months. 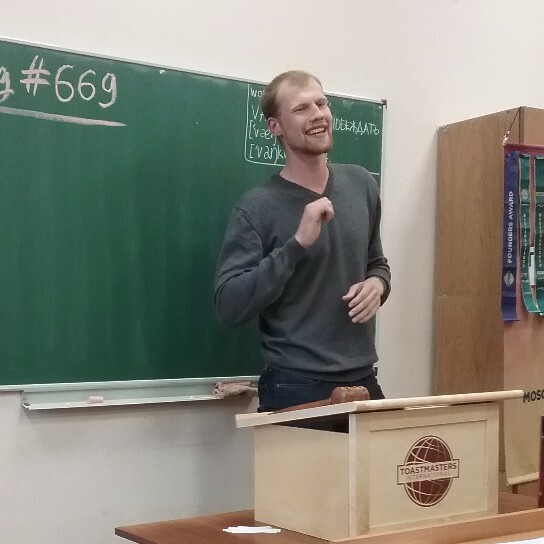 That gave me momentum to take up new roles, so it’s important that you get all the benefits from Toastmasters as early as possible to be a better leader in your life. 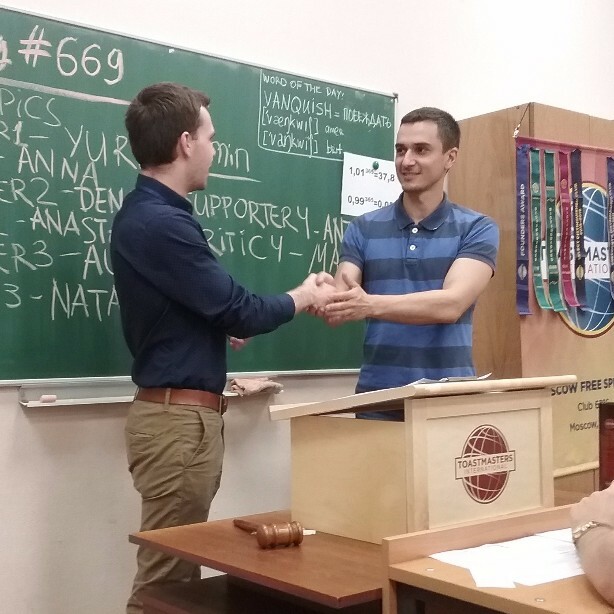 Toastmasters always brings out successful stories of your club members, and their personal experience will inspire you! Be that inspiration to others! 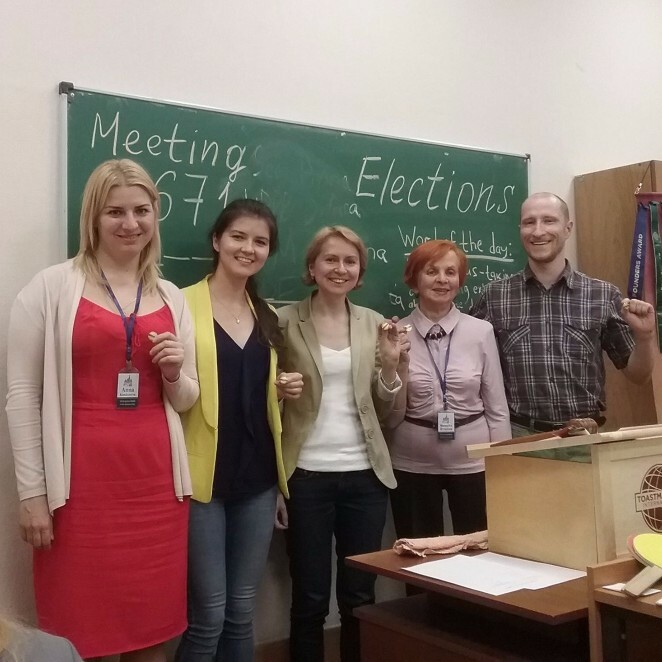 Thank you for visiting our meeting #671 and here is the report. That was our last meeting in the year 2016-2017 so it was time of rewording of members’ achievements, President’s report about the results of the year and new executive committee elections for 2017-2018. Moreover, this meeting was very special thanks to our guests from Dubai club and that we have even two people who completed all Competent Communicator manual projects! Valery Ershkov delivered his project #10 inspiring us to never give up. Congratulations, Valery, with completion of Competent Communicator manual! Olga Makarova delivered her project #10. Thanks to her speech we know how to inspire the team. 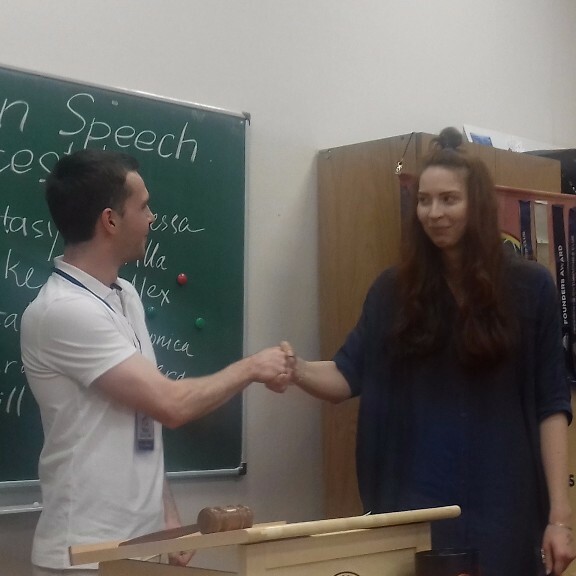 Congratulations, Olga, with CC manual completion! Keep going! It was time to look back and reward achievements and we have winners in 3 nominations: Officer of the Year, Discovery of the Year and Progress of the Year. 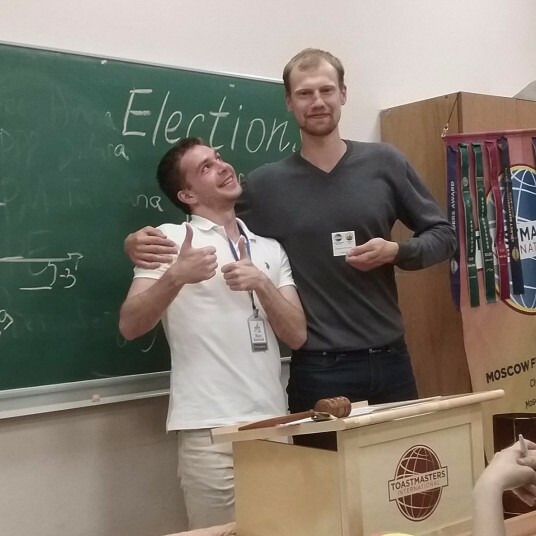 Progress of the Year – Valery Ershkov! Congratulations! 10 projects within one year! Impressive progress! 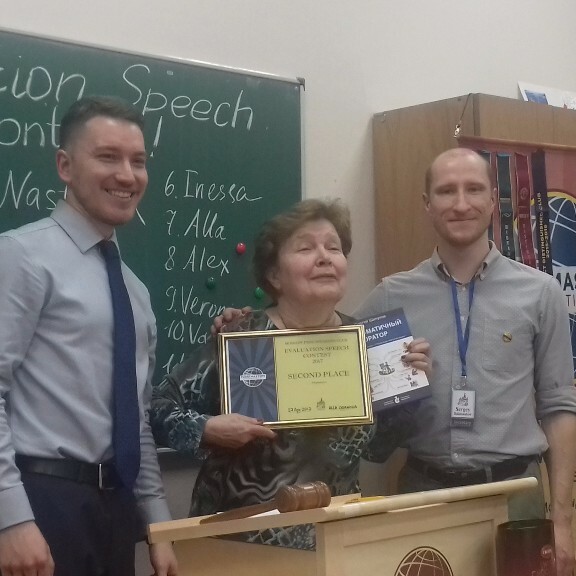 Discovery of the Year – Anna Kondrateva. She joined the club in July’16, delivered 8 projects, won prizes on contests and joined Executive Committee. Congratulations! 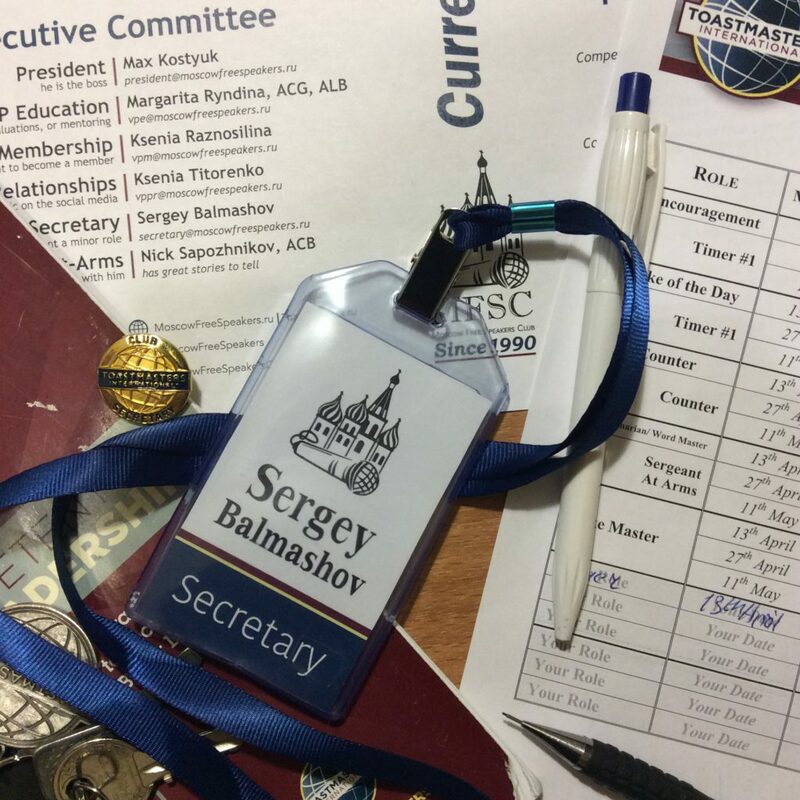 Officer of the Year – Sergey Balmashov. 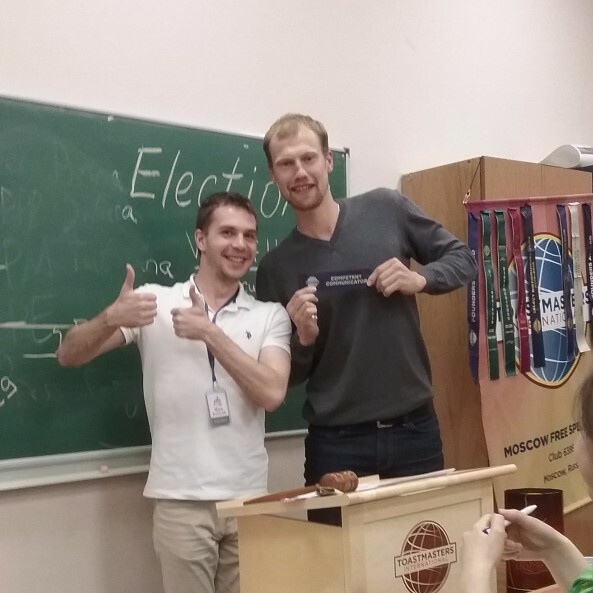 Thank you, Sergey for your hard work and dedication! Our club was very lucky to have you as Secretary! Congratulate the team with their new roles and wish them good luck! 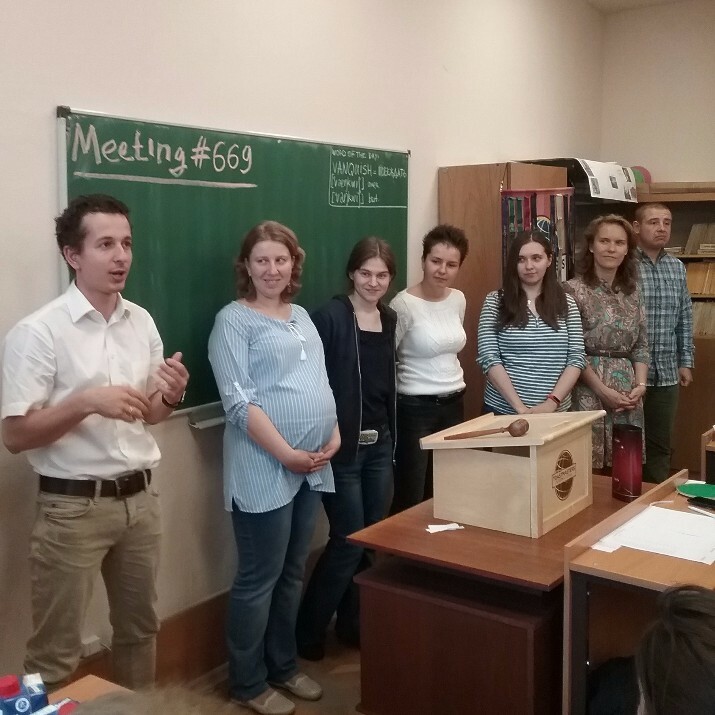 Also we were very glad that our fellow-toastmasters from Dubai club visited our meeting. We had a chance to take an interview from Dharmajan Patteri and soon we will share it. 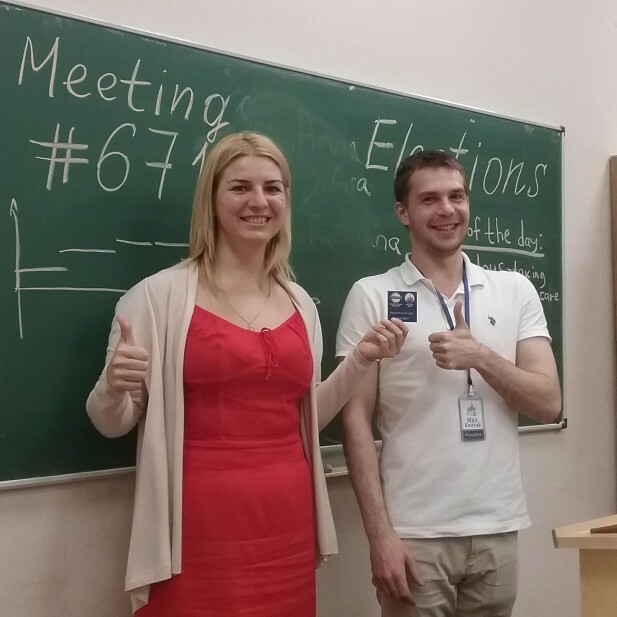 Here is the report from our last meeting! 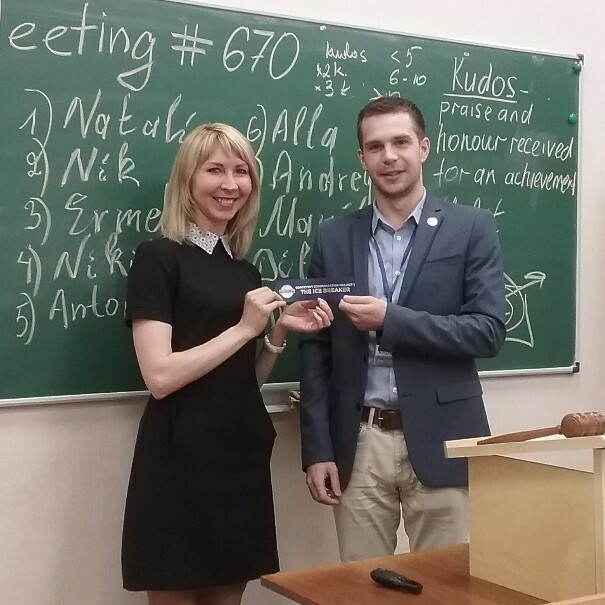 As our meeting #670 took place on 8 June. Today we listened to even two ice-breaking projects! 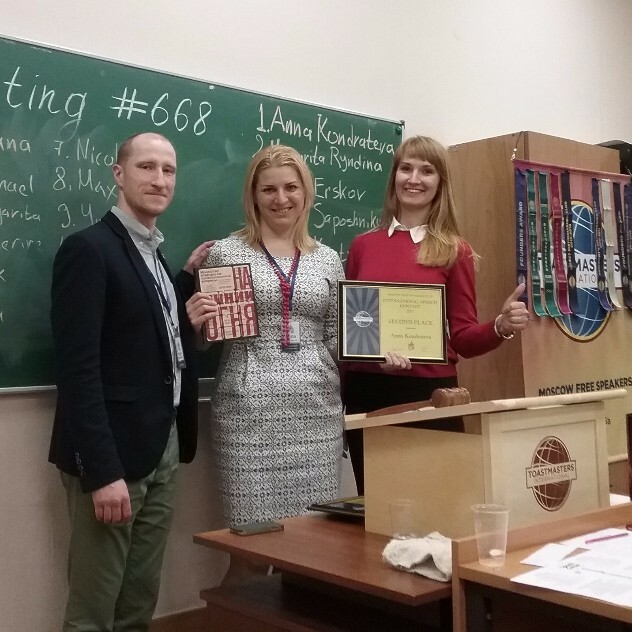 Congratulations, Alissa Ivanova and Dilara Imaeva, with the start of your journey in Toastmasters! The TT session was led by Jane Kakzanova and here is the winner: Maria! 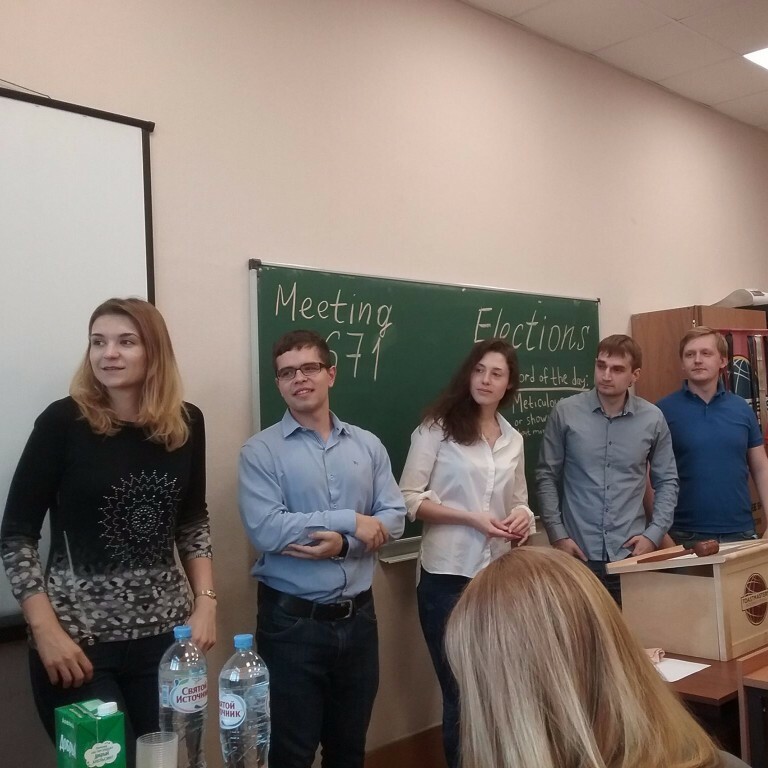 Here is a report from our last meeting! 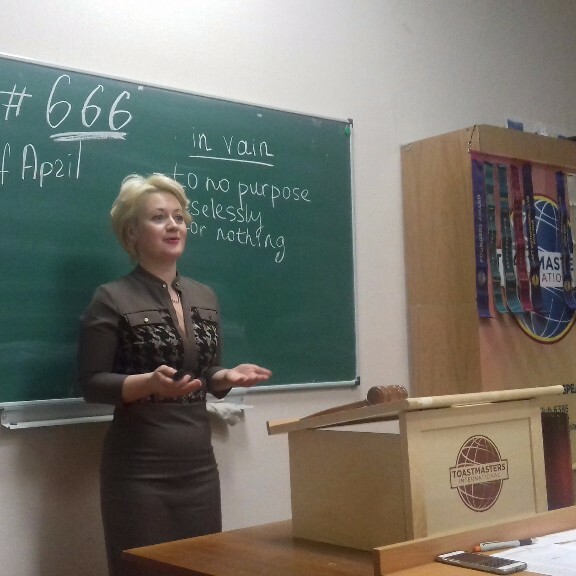 Our first speaker Vera Tolcheeva delivered her project #1 and told us about the meaning of the Victory day for her. 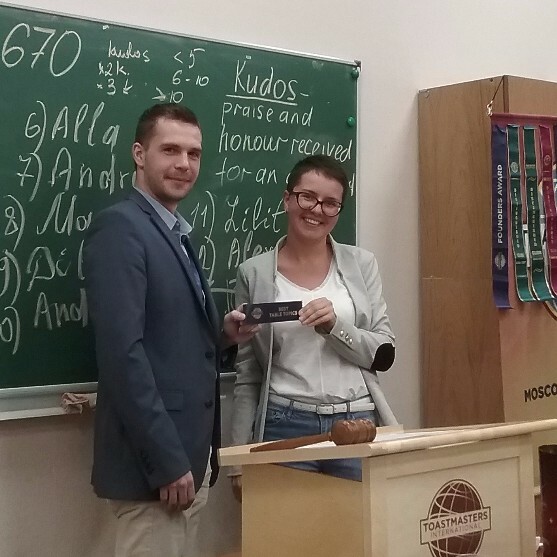 Congratulations, Vera, with your ice-breaker and start of a journey in Toastmasters! Olesya Timerbulatova in her Project #3 told about little steps which lead to great results. 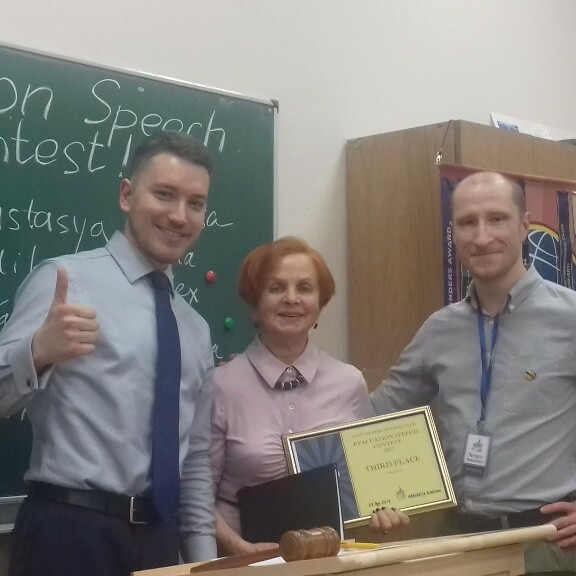 The TT session led by Olga Bazhenov was very exciting and as it consisted of supporting and criticising parts, we have two winners: experienced toastmaster Denis and Anna, who came to our club for the first time! Congratulations! 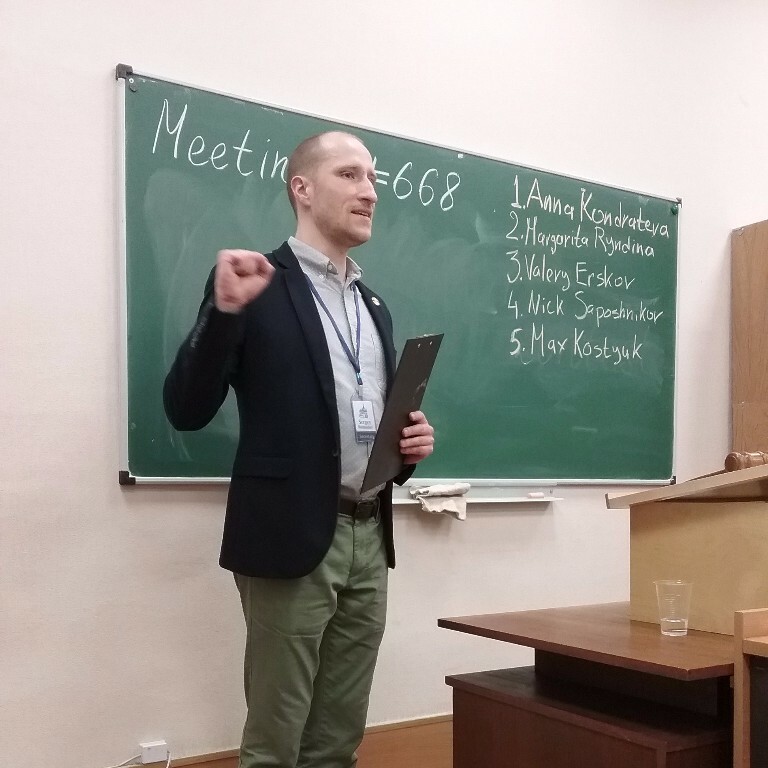 Here is a report from our last two meetings! 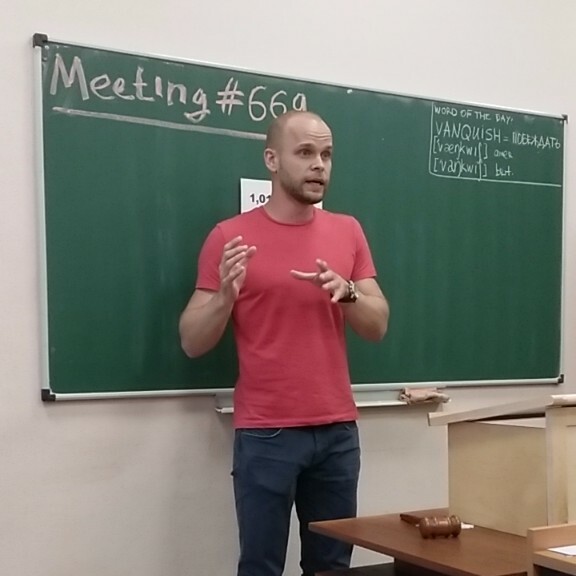 Our meeting #667 took place on 27th April. 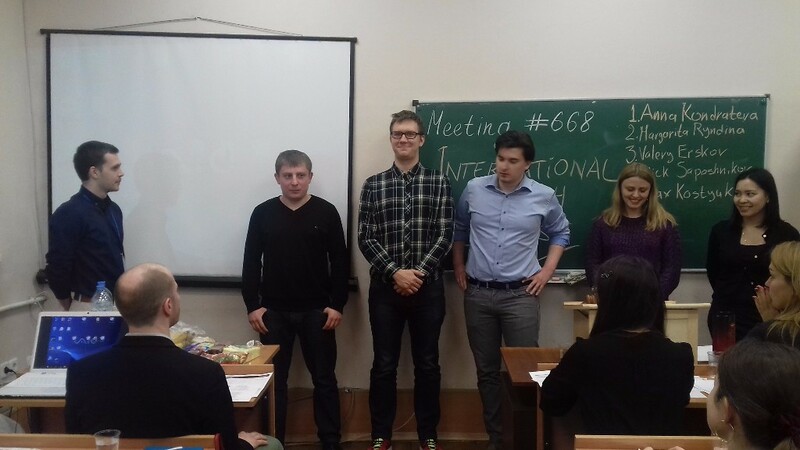 It was devoted to the Evaluation Contest, meeting #668, 11th May, was devoted to the Speech Contest! 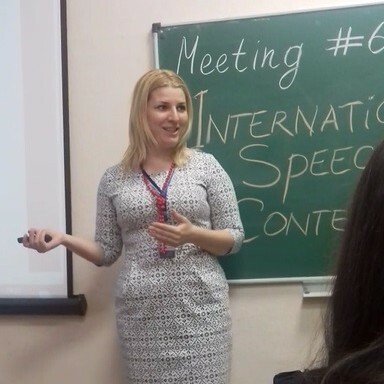 Our target speaker Gaya Oganesyan delivering her project #8. Third place goes to Margarita Ryndina. Congratulations! Second place goes to Alla Oganova. Congratulations! 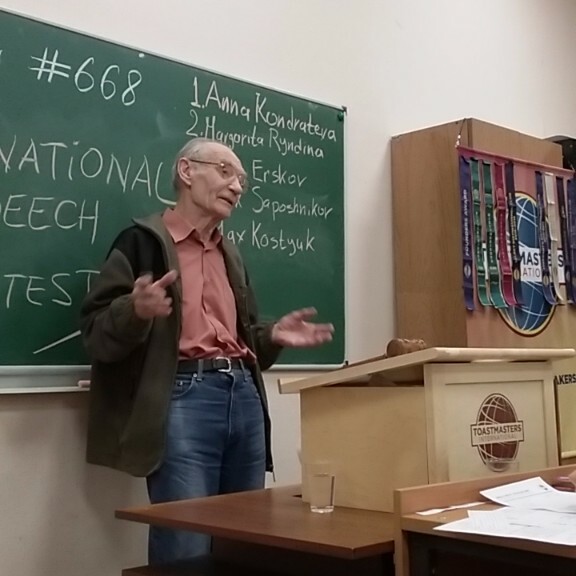 Max Kostyuk won the First and Audience’s choice prizes. Congratulations! 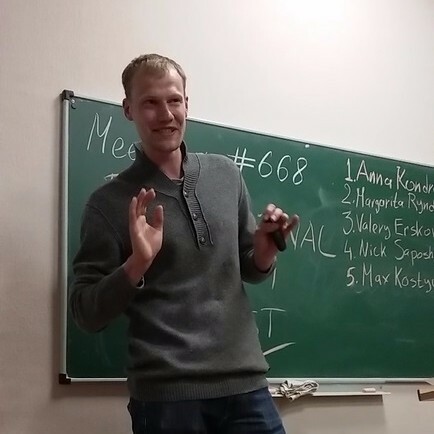 The Table Topics Session was led by Pavel Kaptel and we are especially happy that the winner was our newcomer Anastasiys Slabodkina! Third prize goes to Valery Ershkov. Congratulations! Second place goes to Anna Kondrateva. Congratulations! Margarita Ryndina won the First and Audience’s choice prizes. Congratulations! 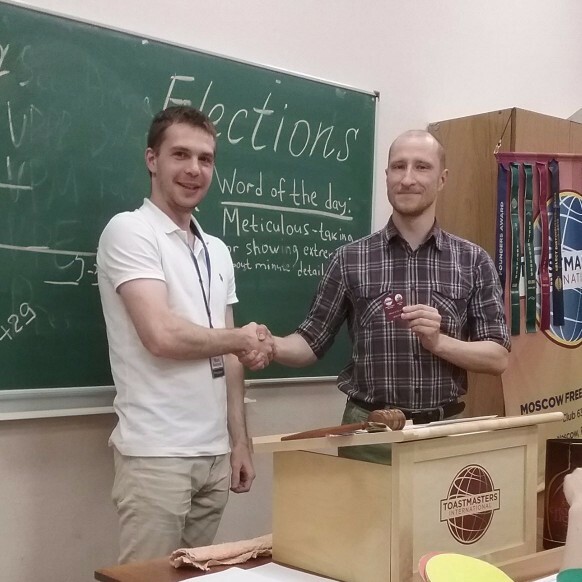 Table Topic winner was Nikolay. Congratulations! 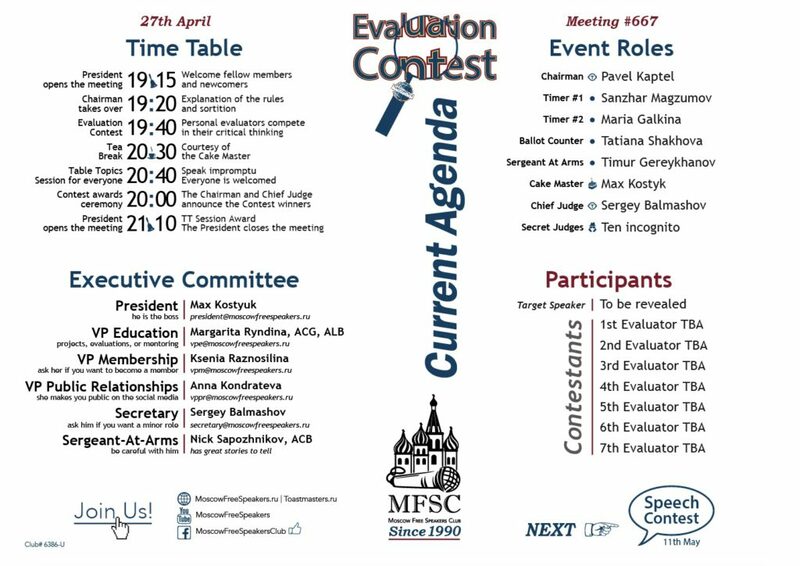 Qualification Evaluation Contest Is Coming! 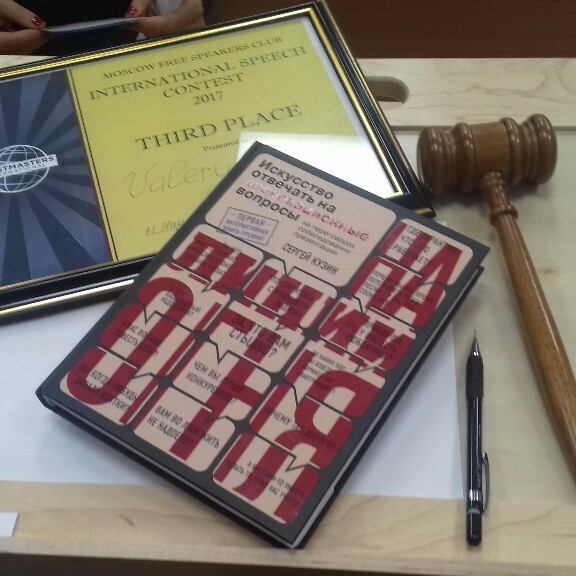 It is three days to go before the Qualification Evaluation Contest! The preparation is in full swing: the Chairman is making sure that all the participants are kept up to date, the Judges are sharpening their pencils (rather violently), Ballot Counter is polishing her abacus, the Timers are fixing and lubricating their timing device, the Target Speaker is rehearsing their speech daily (and most probably nightly), the Contestants are crossing their fingers (possibly checking their horoscopes), and the Sergeant At Arms is training his arms (no pun intended). So, do not be shy, do not hesitate! Pay a visit to our meeting and behold a ones in a year event! It is gonna be exiting for the audience and dreadful for the Contestants. By the way, you may experience the dread yourself if come and decide to take part in the Table Topics Session! See you in the Thursday’s night! 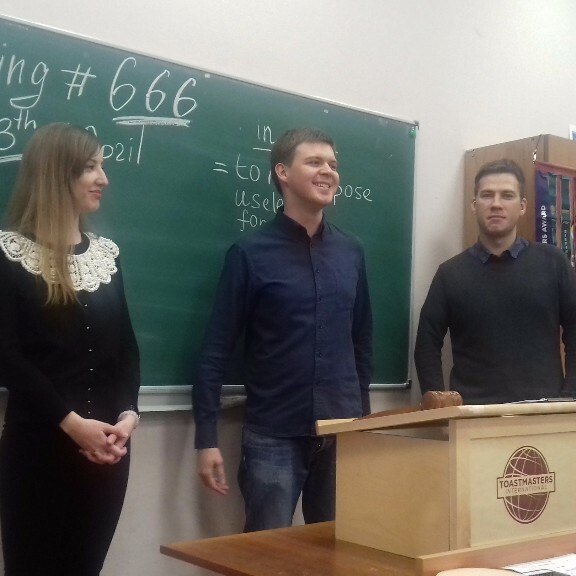 Just right one year ago when I was making my first steps at Toastmasters, I asked Ilya Nefedov, the president of MFSC at that time, – “I wander how the meeting number 666 will go?”. Finally, that day has come. 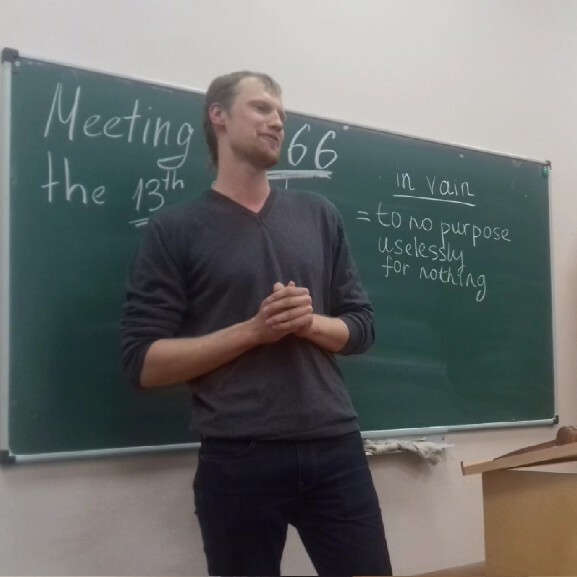 Not only was the meeting’s number symbolic, but also the date itself – April 13th. 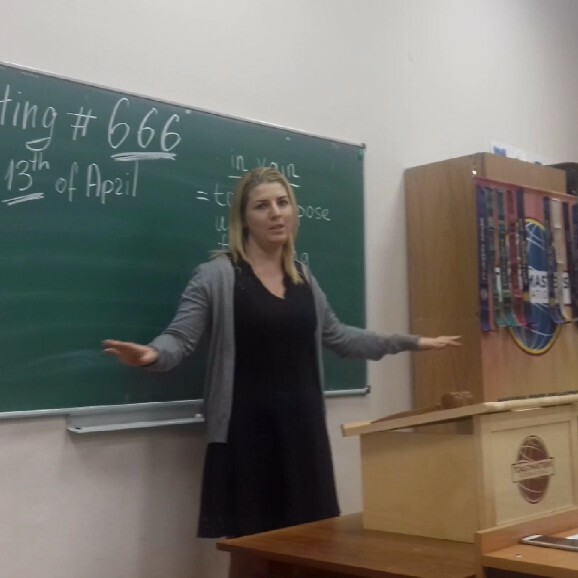 Looking back to time passed, I can clearly see the impact that my involvement at Toastmasters has had on my life, and changes in my character that followed. Yes, this gonna be that retrospective thing which people usually put in a diary. So, who was I at the time when I asked Ilya that question? Just standing up in the middle of a room full of people was a huge struggle. Then, it cost me a lot of effort to get up on stage every time when I had to describe my role or deliver a short speech. However, much more often I would just sit for the whole meeting glued to the chair, unable to put up my hand in an attempt to make an impromptu speech during a table topic session. Gradually, those cautious attempts, that I was making, have paid off resulting in me having hosted meetings, having been a projects’ evaluator, general evaluator, and even having the opportunity to be a chair of the Table Topics Contest at the Area Winter Conference in December 2016. I could not say, though, that I feel absolutely free on stage now, but it has become much more easier for me to quash my fears and get myself into the right mood to speak publicly. Having said that, I certainly have a lot of room for improvement. Now, what is next? The meeting number triple six passed, there are no any other symbolic numbers in the foreseeable future. But does it really matter? 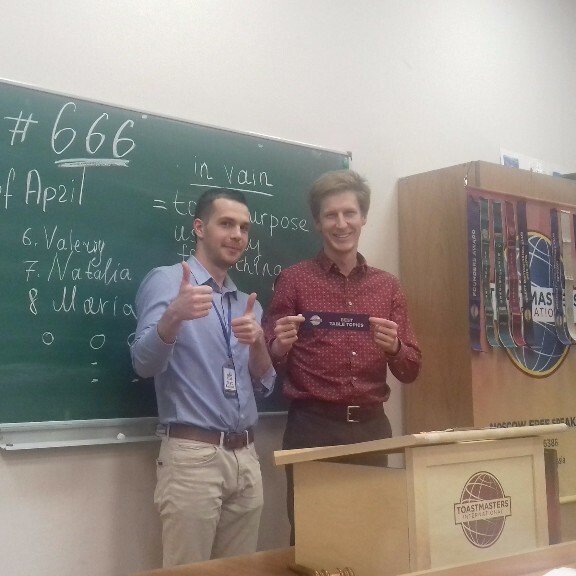 If you have recently joined Toastmasters or have been a member for some time, you already have your own symbolic date when you first stepped over the threshold of any Toastmasters club for whatever reason. I bet that looking back to your personal symbolic date you can clearly see how you developed ip until now with every role taken and every project made. 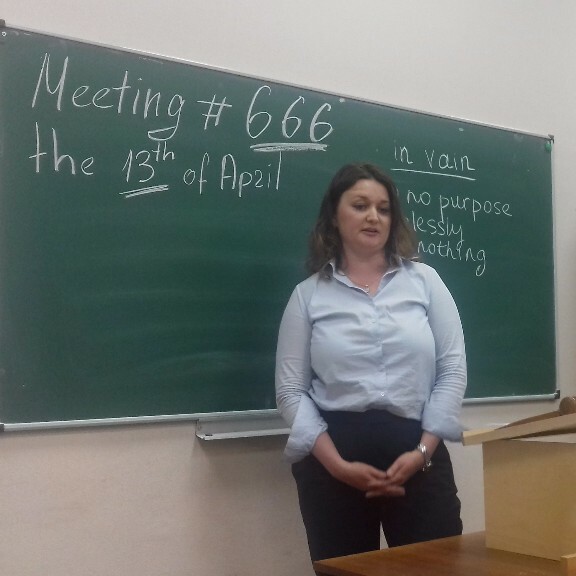 As our meeting #666 took place on 13, the main topic was superstitions and we even had horns on our agenda! 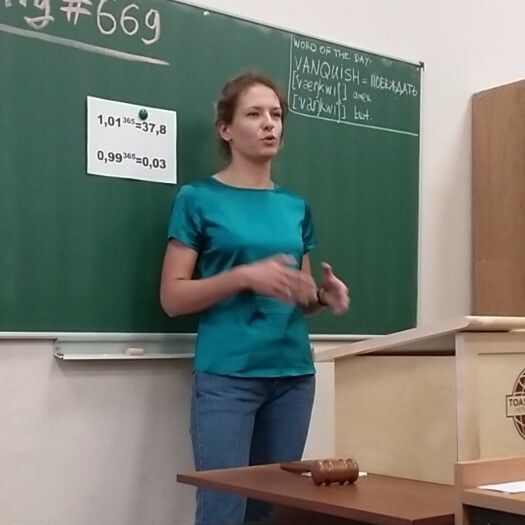 Our first speaker Olesya Timerbulatova delivered her project #2 and told us about the difficult thing of saying “no”. Anna Kondrateva delivered her project #6 about the city of the future. 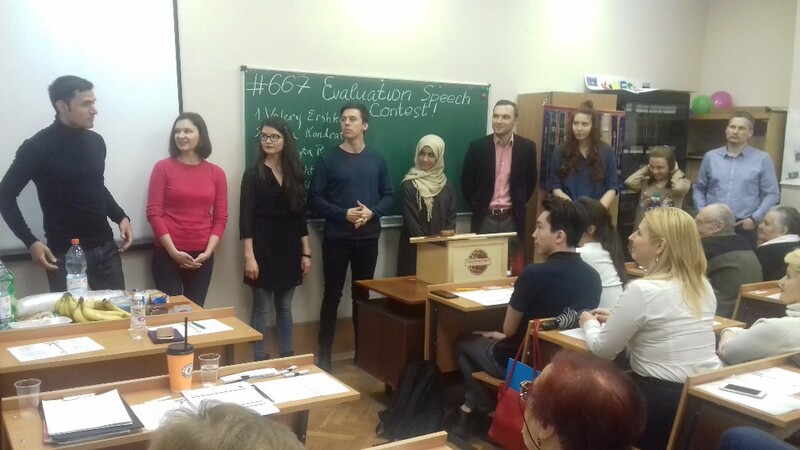 Valeriy Ershkov delivered his project #6 where he demonstrated wide vocal variety ahd his multiple talents! 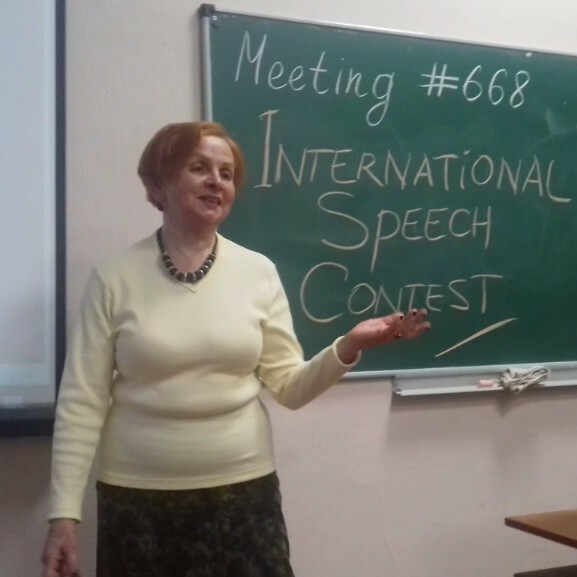 Olga Makarova delivered her project #9 and persuaded us that sport is life. The TT was led by Alice Ivanova and the winner is Ilya Nefedov! Oddly enough, by the end of my term, I have decided to start keeping the secretary’s diary. If it goes well, I hope to continue it with the diary of VP PR. 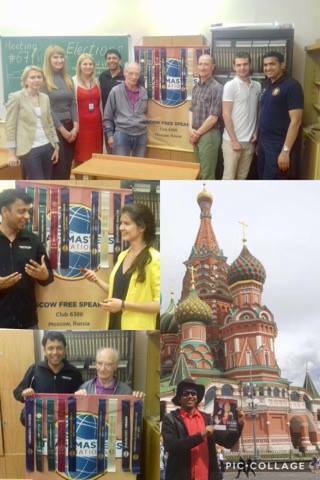 I joined the Moscow Free Speakers Club in spring 2016, and soon became a Secretary of the club in the following summer. I have witnessed the growth of my club and some changes that happened since then, some of which occurred with my personal involvement. Being enrolled with such a social enterprise takes effort and self indulgence. Not only does it teach me communication and leadership skills, but also gives the opportunity to learn how to work in a team and take criticism. However, focussing solely on the club that I am part of narrows down my outlook and makes critical thinking difficult. To be more specific, when I was a General Evaluator last time, I found it problematic to see what people could improve in their performances. Having reflected upon that, I realized, there were two basic issues in my judgement. First, unconscious bias in favor of my club in general and of the meeting attendees in particular. The cause of the bias, I believe, lies partially in my personal involvement with the club, and also in my responsibility for managing minor roles. The second issue is the lack of basis for judgement, as it were. To my view, that basis can be developed by constantly looking at good and not so good examples of roles performing and speeches delivering necessarily followed by comprehensive evaluating. Hopefully, there are other clubs out there, besides MFSC, with experienced speakers and even more experienced evaluators that can help increase the number of examples to follow. Breaking the bias might be a more complex problem. 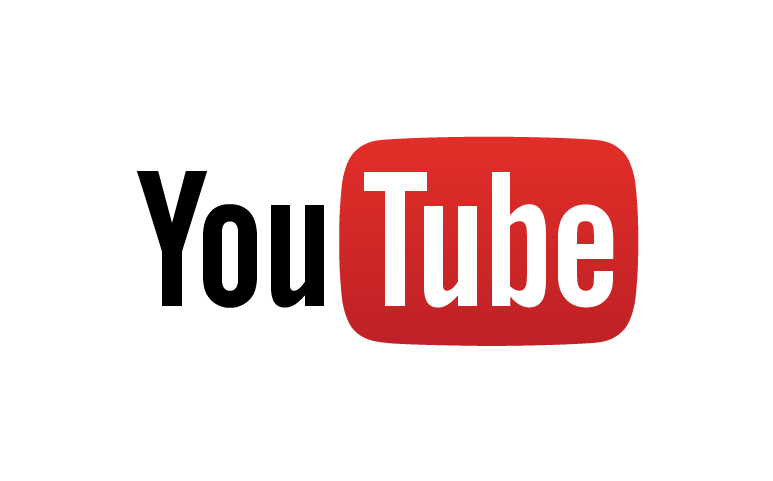 However, I think that with developing critical thinking its effect will diminish and eventually the bias will be taken under control. 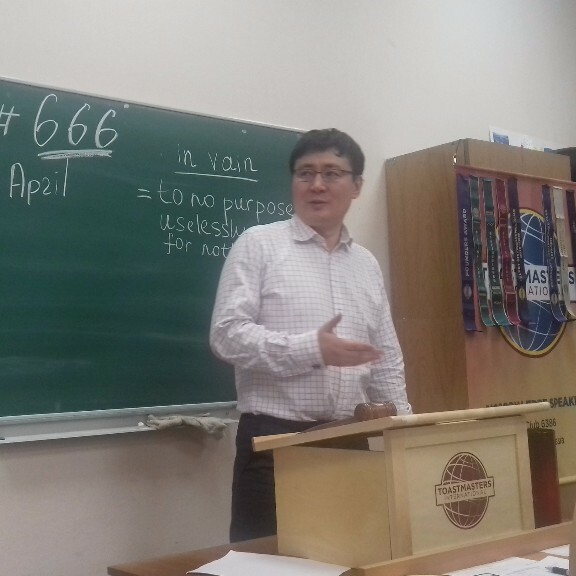 That is why, for such a long time, I decided to pay a visit to the Toastbusters club’s meeting last Wednesday. 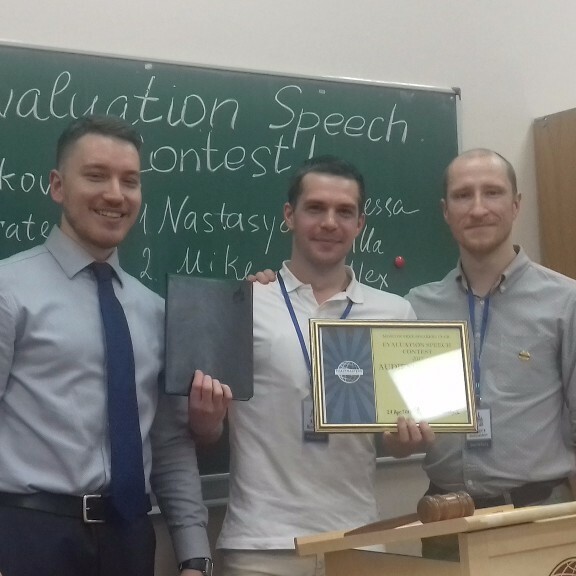 Another reason for that, apart from those mentioned earlier, to take a look at how Toastmasters practices might be done differently. So, was it worth it? It surely was. First of all, listening to the speakers and, more importantly, their personal evaluators’ approach to giving feedback on the projects may and will result in better understanding how I should and should not develop my own approach to future projects and evaluations. 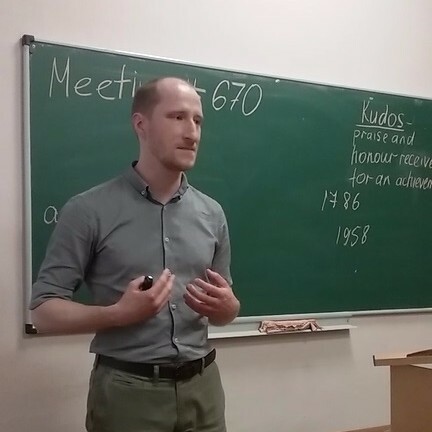 It was also great fun to feel like a newcomer again, when I went up on stage among other newcomers and told the audience about myself, my goals and objectives. 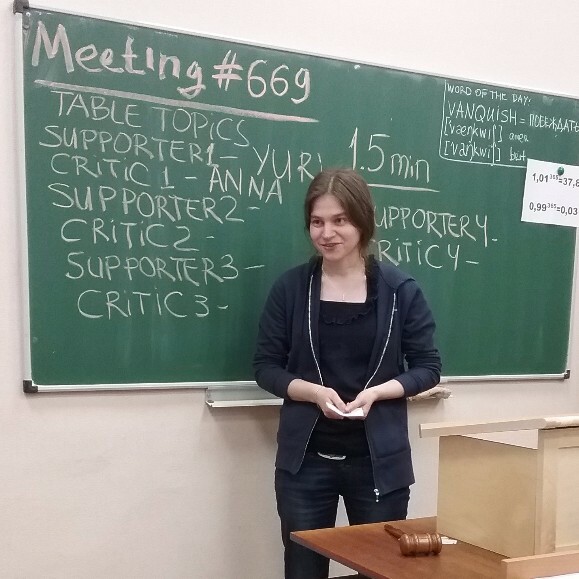 In conclusion, I would like to encourage everyone who is reading these words, especially the new members of Moscow Free Speakers: plan you visit to the other clubs to see how people perform there. 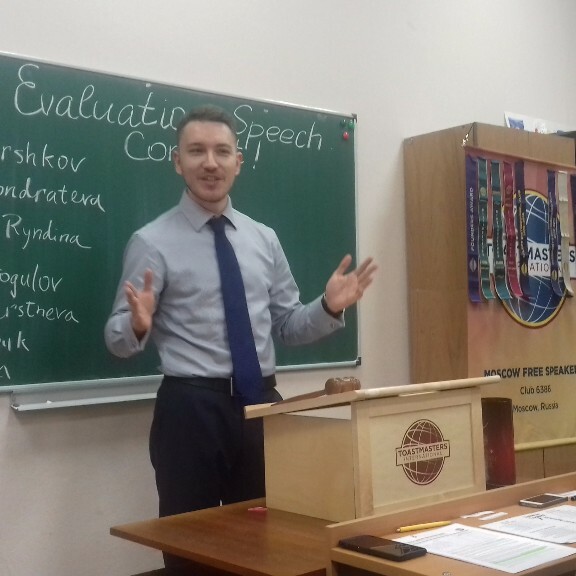 Not only will it help you grow personally in terms of public speaking and leadership skills, but also it will increase your involvement in the great Toastmasters community! So what am I going to do next? Keeping on visiting the other clubs more often!